Occasionally reviews describe a fragrance as smelling “vintage.” To me, it signals that the fragrance follows the conventions of a classic perfume style, like a floral aldehyde with a musk-sandalwood-vetiver base, or a mossy chypre. Besides that, it often means that a perfume simply isn’t fashionable. Olympic Orchids Tropic of Capricorn smells vintage, in the animalic, leathery way of Caron Narcisse Noir Extrait. It’s definitely not fashionable, but it has a lot of style. This is a perfume for Gloria Swanson in Sunset Boulevard. It’s called “Tropic of Capricorn” in honor of the theme, the winter season when it was created, and Henry Miller’s work in which he writes about “the dark fecundity of nature, … a night so frighteningly silent, utterly incomprehensible and eloquent at the same time.” The perfume creates the aura of a still, humid tropical night redolent with the scent of exuberant, blooming life, quick death, and the almost immediate rebirth that springs out of the dead flowers, something sensed at a level below conscious thought. Reading this, do you picture decomposing sludge sprouting flowering vines admid rotting fruit? Translate that image into scent, and you have Tropic of Capricorn — at least, initially. Just after drizzling Tropic of Capricorn on my forearm, I smell leather, Scotch whisky, silver spoons, damp mulch, and the mango I put in the crisper drawer a month ago and forgot about until today. It smells of decay and rooms that haven’t been opened in decades. It’s one formidable fragrance. It wins the “least likely to be duped at Bath & Body Works” prize. All those lovely floral notes listed above? They’re quivering in the corner, afraid to come out lest they be steamrolled by iodine, sludge, and leather. After twenty minutes or so, Tropic of Capricorn stubs out its cigarette and says, “Well, since we’re both stuck here, why not chat a bit?” It relaxes. It becomes less aggressively animalic and sweetens as amber and sandalwood muscle in. Now I smell fruit and a bit of the garden. Tropic of Capricorn is like a big but young wine that is tight and unapproachable until it wakes up to breathe with you for a while. “Scary? Just kidding,” it seems to say. “Now you understand me, don’t you?” And it's delicious. Tropic of Capricorn lasts a good six hours on my skin — not bad for an all-natural scent. If I owned a bottle, I’d be tempted to save it for damp mornings in the garden, or for cocktail events in a bias-cut 1930s gown. 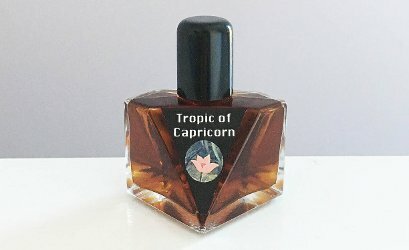 Tropic of Capricorn isn’t for the faint of heart, but if you’re a fan of Vero Profumo Onda and Caron Narcisse Noir in Extrait (and maybe of noir films, blood purple lipstick, and duck liver pâté), it’s worth sampling. Do you have a favorite contemporary fragrance that feels vintage to you? Please share! Olympic Orchids Tropic of Capricorn is available in Extrait only in a 5 ml travel spray ($25), 15 ml screw-top bottle ($65), and 30 ml atomizer ($120). A sample is $6. You can buy it at the Olympic Orchids scent website and at Potion Natural Fragrances. I adore your description of Balenciaga Paris! I wonder if it’s the violet that makes it feel old fashioned? It’s been too long since I’ve smelled it. I think it is the violets that gives it a vintage feeling-but I’m not sure ???? The fragrance always makes me think of another perfume I use to wear doing the 90’s, but I simply cannot remember what it was. I think I need to wear it more often. For me it’s spring/autumn perfume..I can’t wear it doing winter or summer ???? Violets are kind of old fashioned, but so charming. It’s spring now–time to wear it! Death and decay goes on my list to sample! How could I not remember that episode? I was sure I’d seen them all, twice, even. Now I’m going to go look it up…. Thanks for the review! That 5ml is a bit tempting, even though I feel duty-bound to ignore anything done in homage to the overrated Henry Miller. DSH’s Chinchilla is very vintage-smelling to me; the furry note recalls the days when wearing fur was not so politically incorrect . . .
I’m not a big Henry Miller fan, either, so I understand your dilemma! Well I love Noir Films and Foie Gras…so this sounds right up my alley!Will try and sample asap. a contemporary fragrance that smells vintage to me? Two came immediately to mind. ELdO’s The Afternoon of a Faun.When I first smelled it,I thought woah…something is off.Then I tested and tested…and fell in love with the dark foresty-mulchy,slightly sweet oldfashioned chypre.Perfect for Fall weather we arr currently having. Second one!Frederic Malle Portrait of a Lady.That huge overdose of Patchouli-Rose reminds me every time of a certain fur coat my mother used to wear,on nights out to functions during Winter.She used to lavishly spray the coat-her final touch-with whatever perfume she decided to wear that evening.Over the years,many nights out,many perfumes lavishly sprayed,despite several times being cleaned also,a perfume made out of all the previous perfumes sprayed on it,emerged.It smells of seventies hippie shops,lush rose gardens,cigarette smoke and champagne,Elnett hairspray and who knows what else.But when I smell it really close-up?Portrait of a Lady.And my Mother. I adore Afternoon of a Faun! It’s hiding at the back of my perfume cabinet, but as soon as I’m finished with this comment I’m going to move it to the front. And I also adore your memory of your mother’s scent. Your description is absolutely perfect and absolutely Portrait of a Lady. Thank you! Thanks for this review, Angela. I keep forgetting to explore this line, and I really should, based on its fans. In terms of contemporary perfumes that feel vintage, I immediately thought of Roja Dove Diaghilev, but that’s too easy, because his express intention is to replicate vintage richness. Next would be is Eris, which aims to bring vintage glamour to modern life. I’m always surprised by how remarkably well Barbara Herman and Antoine Lie accomplish this. I was also intrigued when Sarah McCartney explained via skype at Arielle Shoshana that she likes to create vintage/classical perfumes for modern lives. She’s even done a date/place series that is specifically focused on recreating a certain period and place (like New York 1968, IIRC) and using only ingredients that were available at that time. Her fragrances don’t smell old or imitative at all, and they are easy to wear, but I think drawing on place, time, and personal stories is what makes them so interesting and pleasing. My favorite response to this question, though, has to be Thierry Mugler Oriental Express from his Les Exceptions series. In general, this series takes classic perfume themes into the 21st century. To me, Oriental Express is a streamlined, sci-fi version of Shalimar. Thank you for the thoughtful response! Yes, of course, the Eris line smells wonderfully vintage. Vintage perfume lovers should definitely check it out. Now I’m curious about Sarah McCartney, too. And Mugler Oriental Express. I’m so behind! Angie: is the Africa stone/hyraceum noticeable? That’s one note I ABHOR…vintage piss. It definitely does have an animalic whiff, but more on the leathery side. Still, it might be a risky scent for you…. I do love when my favorites get a review. To me it smells like hot, steamy rainforest in the early afternoon. With an opening redolent of peaches rotting under the tree. So funky and beautiful. Love it. “Funky and beautiful” is a tantalizing description of almost anything! You’ve outdone yourself with this review. Brava! Well, this perfume does not sound appealing to me, but I enjoyed this review so much – “‘least likely to be duped at Bath & Body Works’ prize”???? I always look forward to your articles Angela! Thank you! If I can provide an entertaining read, at least, I’m happy! I have to try this, it sounds amazing! Kind of like the lovechild of LM Parfums Hard Leather and old-school Diorella. Scroll down to the image of Deltah Midnight Hour (it’s a gorgeous dark incense, along the lines of Lelong Sirocco and Coty Styx, with a touch of orange). I am such a sucker for those old perfume bottles! Thank you for the link. And now I’m craving old Diorella.